Carlisle United have signed Manchester United midfielder Corry Evans on a one-month emergency loan deal. The club hope that the 20-year-old can be registered in time for Saturday's visit of Charlton Athletic. Evans has been capped at international level by Northern Ireland, earning seven caps and scoring one goal in September's win in Slovenia. "United have been absolutely fantastic in helping us," Carlisle boss Greg Abbott said of the signing. Abbott added: "He comes here ready to play and he is the kind of player who keeps us moving in the right direction. "He has proven quality and he has already told us how much he is looking forward to being involved. "We think this is a good signing at a time when we needed to add to the squad in what is a key area." 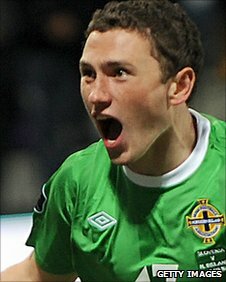 Belfast-born Evans is yet to make his full debut for Manchester United, and is the younger brother of club and international team-mate Jonny Evans.